Custom procedure trays and packs (CPTP) are a set designed to provide all the necessary sterile items required to be used in surgeries. This packs are disposable and designed to meet the individual specification of each hospital, according to their procedure requirements, layout, and even the wrap style, stipulated by the surgical team. This market has been flooded with a vast range of products with customized packages for almost every type of invasive and other procedures. 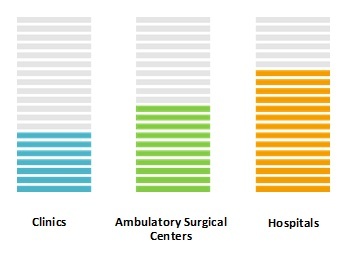 Custom procedure trays and packs have improved operating room efficiencies with faster set-up time, less staff pressure and increased patient throughput thus, propel the overall growth of the market. Hospitals often have special requirements for procedure kits. Choices vary with doctors and even amongst theatre staff, posing a huge challenge for stock holding for a CPTP company. Hence, it is critical for these companies to have the ability to source various products from a number of suppliers. The global custom procedure trays and packs market size was valued at US$ 177.1 million in 2017, and is expected to witness a CAGR of 6.2% over the forecast period (2018 – 2026). Increasing number of surgical procedures is fuelling the adoption of custom procedure trays and packs (CPTP) market during the forecast period. For instance, according to the WHO, global volume of the surgeries performed in 2012 was estimated to 266.2 to 359.5 million, out of which one in every 20 operations globally was done in very-low-expenditure Member States. Increase in geriatric population, who are more likely to develop chronic wounds as they have more medical issues affecting their general health and mobility, has been partly responsible for the growth in procedures and the resultant expansion of the CPTP market. For instance, according to research article in semantics scholar, 15-20% people aged 60+ hospitalized in lifetime with wound causes. However, it is difficult to quantify the savings that could be generated and to qualify the true benefits until procedure packs are fully utilized. But there may be an opportunities for a better alignment of the functions necessary to generate savings. This will require close working between frontline staff, hospital managers and procurement professionals to design and use packs in the most efficient and cost effective way possible. Custom procedure trays and packs market is segmented into six major regions- North America, Latin America, Europe, Asia Pacific, Middle East, and Africa. Rising healthcare awareness levels and government initiatives to lay down the sterility condition in the hospitals is a major factor driving growth of the custom procedure trays and packs market in North America and Europe region. The Government of United Kingdom has formed a 'Trust infection control committee' in 2016, which has formulated specific standards for the degree of sterility to be adhered to inside an operation theatre. The committee has also laid down specifications to prevent infection in other minimally invasive procedures like ophthalmic procedures, which would require minimum downtime. Usage of prepacked, sterilized kits would greatly contribute to the reduction of any nosocomial and iatrogenic infections. The Asia Pacific is estimated to witness significant growth in custom procedure trays and packs market, owing to increasing number of small companies, increased expenditure on healthcare and growing medical tourism for surgeries. For instance, India offers several super specialty hospitals dedicated to providing cardiology and cardiothoracic surgery, orthopedic surgery, organ transplant surgery etc. at affordable and inexpensive costs, approximately 30 % to 70 % lower than the costs in the United States, make Health Tourism to India highly appealing to an overseas patient. The market is highly fragmented, with a large number of participants in the CPT business. The increased need for convenience, speed of operations and more efficient hospital management are driving the customer demand. A number of companies are expected to enter this market in the future, with the likelihood of merger and acquisition activity over the next five years being extremely high. For instance, in 2017, Medline make a deal to acquire Centurion Medical Products, containing full set of vascular access products that complement its minor procedure tray offerings and its growing infection prevention focus. Custom procedure trays and packs (CPTP) are selection of components ranging from sutures, surgical swabs, wound dressings, drapes, and surgical blades to cardiac catheters and implants, providing healthcare providers to work more efficiently to deliver high quality healthcare and potentially leaving patients less exposed to hospital associated infections. Custom procedure packs can also reduce the amount of waste generated by units. The Kingston Hospital study saw the number of clinical waste bags reduce by 50% in 2015. Furthermore, an initiative in The Royal Liverpool and Broadgreen University Hospitals found that utilising procedure packs allowed them to eliminate one bag of rubbish per procedure. The global custom procedure trays and packs market is projected to witness significant growth over the forecast period, owing to increasing prevalence of chronic and hospital associated diseases and surgical procedures. For instance, according to the WHO, global volume of the surgeries performed in 2012 was estimated to 266.2 to 359.5 million, out of which one in every 20 operations globally was done in very-low-expenditure Member States. Manufactures are adopting various strategies over tendering process and e-auctioning practices, as tendering process and e-auctioning practices is very common in this market to procure the products from those manufacturers that offers at low prices. Such strategies include, the stripping down of non-essential components of CPTP. Companies are looking forward for in-house manufacturing of CPTP components, rather than sourcing them from other OEMs, this strategy, together with the move to reduce packaging costs and expand distribution structure with stocking capabilities, will guarantee strong revenue growth for market participants. For instance, in 2017, Molnlycke Health Care built a new state-of-the-art procedure tray factory with in-house sterilisation in Europe which expands their production capacity and ability to provide a game-changing level of procedure tray service. The global custom procedure trays and packs market report caters to various stakeholders in this industry, including investors, product manufacturers, distributors and suppliers for custom procedure trays and packs market, research and consulting firms, new entrants and financial analysts. *Browse 38 market data tables and 33 figures on "Custom Procedure Trays and Packs Market” - Global forecast to 2026”.